Real-world gains measured at the wheels, 11hp in this example. Driving these accessories at higher rpm is a waste of energy, running it at a much higher rate than it needs to for optimum effectiveness. This is energy which could be put toward acceleration instead. For a specific example, the BMW water pump loses efficiency at high rpm as the water just cavitates (makes bubbles) instead of flowing faster. Slowing down the water pump actually makes it more effective, especially for sustained high-rpm use. UUC Motorwerks Ultimate Underdrive Pulley set provides replacement pulleys for the water pump, power and steering pump. We do not provide an alternator pulley because, due to the alternator's voltage regulator, an underdriven alternator has no power gains. WARNING: Some companies have been marketing replicas of UUC's original pulley design, but advertising them as superior due to "light weight". This clearly shows these replica manufacturers do not have an understanding of the underdrive concept... weight reduction is not a factor in producing power with underdrive pulleys. The gain comes from reducing the accessory speed, not from less rotating mass. While some pulley advertisers do advertise "lightest weight", we feel that to be somewhat deceptive... in our extensive testing, we have proven that the actual weight of the pulleys is not a factor in increasing power gains whatsoever. Each pulley itself weighs just a few ounces. Shaving off a small amount of additional aluminum will not make one single bit of measurable power. Weight savings in a BMW that are important are in the much larger rotating components such as a lightened flywheel or lighter road wheels. The price for this gain is the loss of the tuned elastomeric harmonic damper. The crankshaft on your inline six is subject to a wide variety of vibrations and harmonic phenomenon. Could UUC have designed a replacement crankshaft pulley to our satisfaction? Absolutely. But then we'd have no way to recommend one of our favorite performance modifications, the lightweight flywheelylish and functional, our solid stainless steel shift knobs improve shifting feel and positive gear engagement. Fundamental physics hasn’t changed much since the days of my high school physics class. When you attach two pulleys together, changing the ratio of one pulley changes the amount of work you must put in to “lift” a certain object a specified distance. Most modern engines employ various pulleys, driven by belts connected to the crankshaft by a main pulley, to supply power and drive various accessories on a vehicle. BMW has designed specific pulleys in the engine compartment to drive the alternator, water pump, power steering pump, and A/C compressor. These accessories present a parasitic drag on the engine’s horsepower. One way to reclaim that hidden horsepower is to replace some of the pulleys with an “under-drive” pulley. I’m sure we’re all familiar with the term “over-drive”, a ratio smaller than 1:1 in the gearbox to achieve higher speed at a given RPM. Under-driving a pulley is the exact opposite. A larger diameter pulley is used so that the accessory will make fewer turns for every engine revolution, thus requiring less work from the engine, but also resulting in less work done by the accessory. 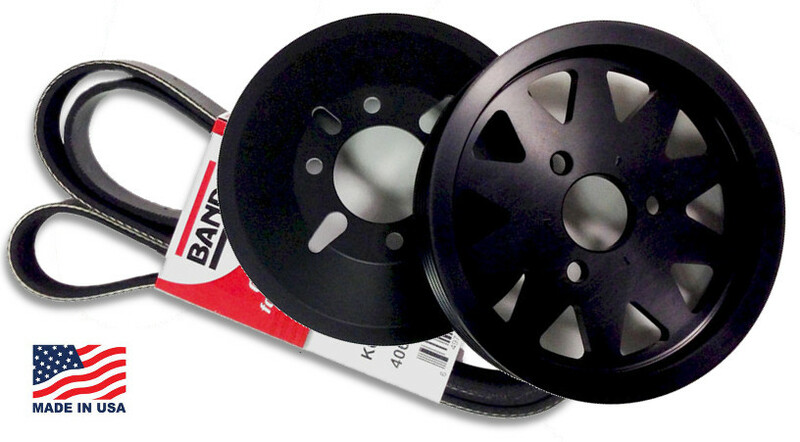 UUC’s Ultimate Underdrive Pulley kit comes with a replacement pulley for the water pump and the power steering pump. It comes with two aircraft quality machined pulleys anodized in silver or black, along with a replacement belt. The built quality of the kit is excellent, with flawless machining on the pulleys and a beautiful design. I optioned for the black anodized pulley set to blend into the engine surround. Installation of the kit is about as simple as turning a few wrenches, especially on cars that does not come with a mechanical cooling fan. On models that come with the mechanical fan, you will need the fan clutch removal tool (a long, 32mm/36mm wrench). Other than that there isn’t really any special tools required to do this job. The bolts that hold down the water pump pulley are 10mm bolt, and the bolts that hold down the power steering pump pulley are 13mm. There are some simple rivets and screws you will need to remove if you intend to remove the electrical fan, to allow you additional access to the pulleys, and you will need a 16mm socket/wrench to turn the AC belt tensioner and a T50 Torx bit to turn the accessory belt tensioner. Installation is as simple as remove belt, remove pulley, install new pulley, and install new belt. Entire procedure takes about 1 hour for a shady tree mechanic, including jacking up the car and all the prep work. UUC includes a detailed instruction set with pictures and easy to follow steps, which takes all the guesswork out of a DIY project. Well, they say it’s almost impossible to feel any performance improvement under 10% by the seat of the pants. UUC proclaims a 4hp-11hp increase measured at the drive wheel, which for most modern BMWs is a less than 10% increase. Despite the moderate claims, there are tangible benefits to the pulley kit that you CAN feel. One of the most immediate results of installing the pulley kit is better engine response to throttle input. As best as I can describe it, it feels like the engine is “lighter”, or that it’s got less drag on it. The most obvious evidence of this is when you are engine-braking. There’s less drag on the engine and it takes longer for the car to slow-down. I’ve noticed a small increase of about 0.5 miles to a gallon since my last fill-up. Another benefit seems to be when I’m executing heel-toe downshifts. Since the engine seems more willing to rev up, I find it easier to control my blips to match the revs. This is one of the more affordable and safe modifications you can make to your engine. Since the UUC kit does not under-drive the main crankshaft pulley, which acts as the harmonic dampener for the inline 6 engines, and it does not under-drive the alternator, it eliminates two of the sources for possible problems down the road. Some kits that under-drives the alternator may result in dropped voltage to drive in-car electronics, or alternator interference that decreases the performance of your FM and AM reception. And since the kit is so easy to install, if you’re familiar with changing the oil in your car and have the proper tools you should be able to perform this modification yourself. Best of all, it is certainly one of the most affordable modifications you can make to your car at this price point. I’ve now recommended and installed 3 sets of UUC’s Ultimate Underdrive Pulleys on a few friends’ BMWs, and I have to say this is an excellent bang for the buck product. Especially for those with 2.5 liter engines, which suffer from the drag on these various accessories more than the 2.8, 3.0 liter or 3.2 liter engines due to the smaller displacement. If you have a couple of hundred dollars allocated to modify your car, this is one of the product you should put very high up on the list of things to get.